Hostile action What if the Californian, Herald and Sentinel are all owned by the same New York hedge fund? The Salinas Californian has sustained its share of cuts, reductions, closures and layoffs. But now comes word that Gannett, its parent company and the publisher of USA Today, is the target of a hostile takeover by the slash-and-burn specialists that have already rendered the Santa Cruz Sentinel and the Monterey County Herald to the sad shells of what they once were. Billing itself as a savior of newspapers, vulture hedge fund Alden Global Capital has made a $1.36 billion hostile takeover bid to acquire Gannett’s chain of more than 100 local papers. This means the Salinas Californian, the Monterey Herald and the Santa Cruz Sentinel could soon all be owned by the same group of budget-slashing Manhattan capitalists. As of today, the Herald and Sentinel are both owned by Digital First Media, which is controlled by Alden Global Capital and publishes around 200 dailies and weeklies. The Californian is owned by Gannett, publisher of USA Today and scores of community papers around the country. Whether the Justice Department would allow Alden-Digital First Media to create such a monopolistic trifecta isn’t clear. The DOJ did step in a few years ago to prevent the Tribune Company from buying the Orange County Register, citing antitrust concerns. And antitrust rules are why, when Digital First’s predecessor MediaNews bought the Herald, the Mercury News, the Contra Costa Times and other papers back in 2006, the Herald’s proximity to the Californian required that Monterey be placed in a separate holding company. But considering Digital First’s current near-total ownership of both Northern and Southern California newspapers, whether Justice would try to stop this latest consolidation is anyone’s guess. If successful, the takeover of Gannett would make Digital First the largest newspaper chain in the country (in terms of circulation), while extending Alden’s heavily criticized slash-and-burn strategy to hundreds of U.S. communities. The Wall Street Journal broke the takeover story Sunday night and press releases and official statements from both Digital First and Gannett confirmed the report early Monday. Gannett Co. shares rose from $9.75 on Friday to $11.71 on Monday following the news. Digital First, which disclosed it already owns a 7.5 percent stake in Gannett, is offering to pay $12 a share. DFM newsrooms like the Herald and Sentinel face reporting deadlines as early as 2 p.m., severely limiting their ability to cover public meetings and even high school sports. The privately held Digital First, known in the business world as Media News Group Enterprises, MNG Enterprises or just DFM, also revealed previously guarded financial details in a press release explaining the transaction. Digital First and Alden appeared on the national radar last year, after the Denver Post’s editorial board blasted Alden’s practices in a six-page section published just as the newsroom grappled with a 30 percent cut in staff. It became known as “The Denver Rebellion,” and management’s subsequent efforts to censor DFM papers’ coverage of the issue drew the scrutiny of media critics from the Washington Post to Bloomberg. “I think it’s terrible news for Gannett’s readers and anyone who works for Gannett,” said Dan Kennedy, associate professor at Northeastern University’s School of Journalism in Boston, and author of the Media Nation blog, “The Wired City: Reimagining Journalism and Civic Life in the Post-Newspaper Age,” and “The Return of the Moguls.”. Gannett has garnered its own share of criticism for severe staff cuts, but Kennedy says DFM has taken the slashing to new lows. The NewsGuild, which represents workers at 12 Digital First newspapers — including the Herald — issued a statement Monday opposing the proposed takeover. “A purchase of Gannett by Digital First Media would result in a dangerous loss of local reporting, more consolidation, and the strip-mining of Gannett’s newspaper assets at a time when the industry demands owners who are committed to reinvestment in journalism and when citizens need local news coverage more than ever,” the statement reads. While Gannett and other papers across the country have undergone severe staff cuts, NewsGuild officials say DFM sets new records, cutting the union workforce at 12 DFM papers from 1,552 in 2012 to 487 in December 2018 — a decline of nearly 70 percent. A comparison with Bureau of Labor statistics and a study from The Pew Research Center shows this is nearly twice the national rate. And because of the company’s aggressive consolidation of tasks like printing and copy editing, some DFM newsrooms like the Herald and Sentinel face reporting deadlines as early as 2 p.m., severely limiting their ability to cover public meetings and even high school sports. Both papers are proofread and printed six hours away in Chico. It’s these kinds of practices, which engender fears of more “news deserts” leaving communities with little to no local news coverage, that have observers worried about a DFM takeover of Gannett. 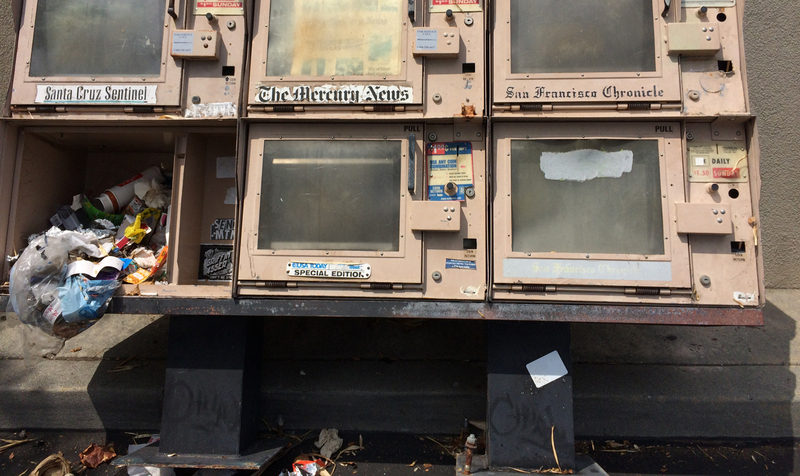 Harvard Nieman Lab’s media analyst Ken Doctor (and Monterey Bay region resident) characterizes Digital First as “the most reviled newspaper owner in the business” and said Gannett’s board might be able resist the takeover by merging with The Tribune Company. The privately held DFM, which has long held any hint of its financial status close to the vest, even posted this chart contrasting its profits with Gannett’s, citing “proprietary data” as the source for the DFM/MediaNews numbers. Doctor, who first reported detailed financials showing DFM papers were highly profitable in 2017, hasn’t reported numbers for the most recent fiscal year. That makes Alden’s acknowledgement of a 16.2 margin last year — with steadily increasing profits — all the more notable. According to Doctor, all of DFM’s Northern California papers, which include the Herald and Sentinel, made a combined $52 million in fiscal 2017, for a profit margin of 21 percent. This is more than double the margin of most newspapers, which tend to bring in around 7 to 8 percent. “I’ve been hearing they are very well satisfied with their profits,” Doctor told Voices. A spokesperson for DFM/Alden said the firm is a “long-term investor” in the newspaper business and is trying to make its papers sustainable for the long haul. The spokesperson, who would only speak on background, said Alden had concerns about Gannett’s recent investments into digital ad services as opposed to investing in its core business of newspapers. The spokesperson declined to comment further and said DFM board chairman Joe Fuchs’ letter to Gannett’s board speaks for itself. We Save Newspapers: When other people won’t step up, we do. We save newspapers and position them for a strong and profitable future so they can weather the secular decline. Take our last two acquisitions – The Orange County Register and The Boston Herald. Both papers were left for dead and put into bankruptcy by their former owners, which could have caused a liquidation and a loss of all the jobs. MNG stepped up and invested in them when others wouldn’t, saving many of those jobs and providing for new jobs. We improved operations and made them viable and profitable by providing them with new leadership, a seasoned executive team and a new strategy when others clearly had failed. In its Monday statement, DFM said it was initiating the offer partly because of Gannett’s investments in digital advertising products. He was referring to Alden founder Randall Smith’s vast South Florida real estate holdings purchased after Alden acquired Digital First. Kennedy noted DFM’s decision to place Boston Herald editor Joe Sciacca at the helm of six other papers as an example of taking consolidation to ridiculous — some would say dangerous — new extremes. It may be absurd, but it seems obvious that if DFM takes over Gannett, a Herald or Sentinel editor would surely be put in charge of the Californian too. The few brave, remaining reporters would be laid off, the three papers would share their meager content and ultimately, they’d morph into one “regional” paper that would be a shadow of the three once-independent newspapers’ former selves. Don’t laugh. It happened in the Bay Area and it can — will — happen here if Alden gets its way. CLARIFICATION: A previous version of this story implied Monterey Herald editor Dave Kellogg is also editor of the Santa Cruz Sentinel. However, that dual role was temporary and he is no longer editing both papers. Julie Reynolds Martínez is a freelance journalist who has reported for the Center for Investigative Reporting, The Nation, NPR, PBS, the NewsGuild and other outlets. She is a co-founder of Voices of Monterey Bay.